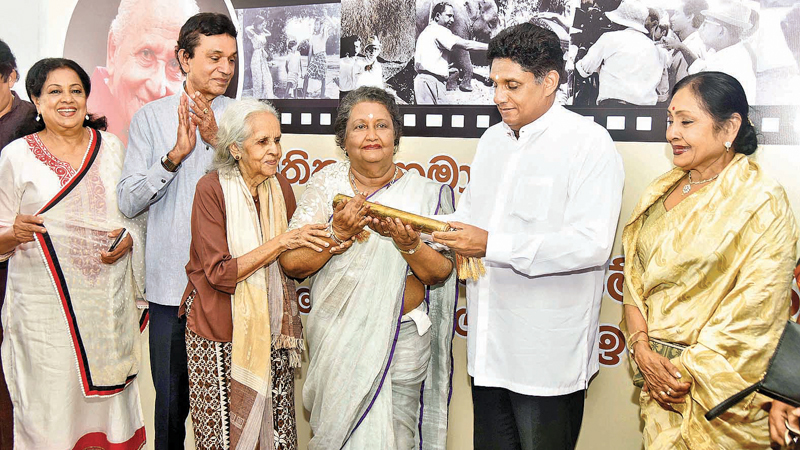 Minister Sajith Premadasa with silver screen stars Malini Fonseka, Ravindra Randeniya, Iranganie Serasinghe, film director Sumithra Peiris, and Swineetha Weerasinghe, at the event. Housing, Construction and Cultural Affairs Minister Sajith Premadasa pledged to take all possible measures to depoliticise the country’s cinema industry. The Minister said important decisions are scheduled to be taken in the near future for the betterment of the local cinema industry. Speaking at the National Cinema Day celebrations at National Film Corporation on Friday, Minister Premadasa said Sri Lanka’s cinema industry has been totally politicised, directly or indirectly. “We have to get the experts involved in making key decisions related to the cinema industry,” said the Minister. He said an impartial advisory committee has already been appointed to take necessary decisions to uplift the cinema industry. “Many more measures are scheduled to be taken to strengthen the long-neglected cinema industry,” he said. The Minister underlined the importance of considering the history of the country’s cinema industry and reasons for its decline after the golden era of 1970-80, before taking decisions for its development.